Simply opening these covers commits you to being dazzled by 100 of the UK's top "writers" and street artists, immersing yourself in the styles, past and present, which make UK street art great. Upon its arrival in the UK from New York in the 1980s, graffiti rapidly spread across the island, infecting the youth like a stylistic virus. Out of the early days came names that would become part of UK writing legend, such as Mode2, Zaki Dee 163, Choci Roc, Goldie, and Robbo. Alongside works by these pioneers, we sweep across the whole of the UK, taking in Scotland and Wales, running through the nineties and right up to the modern day when more advanced, technical graffiti, wheat pasting, and stenciling are the new media on the street. This collection includes works by Aroe, Skore, Xens and Kem, Mef, and more. Guiding us through this review is Steam 156, who was there at the start and is still as passionate as ever. 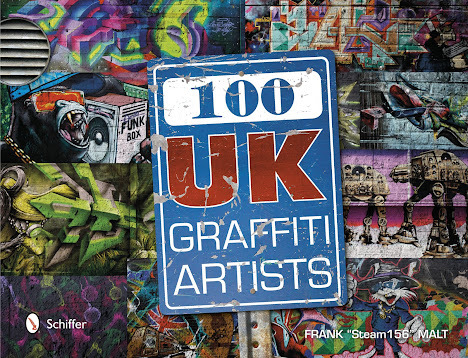 This is a must-have collection for graffiti writers and fans around the world.